Today, many schools are cutting back on physical activity in schools in favor of more time spent in the classroom, but research shows that students that engage in structured active play show better memory retention, focus, and classroom performance. Sports not only encourage physical health and brain development, but also develop key motor skills in young children. Structured physical play also teaches discipline, teamwork, goal-setting, self-confidence, and more. However, even preschools which understand the important link between structured physical programs and student success lack the time and resources to develop and implement such programs. That’s where Amazing Athletes comes in. Since the early 2000s, Amazing Athletes has been a proud part of Pacific Preschool & Kindergarten’s three locations in Southern California. Lynda Way is the founder of Pacific Preschool & Kindergarten and has more than 40 years of experience working with young children in the field of education. She has watched Amazing Athletes grow and transform over that time to empower more students to live healthy, active lives. “Amazing Athletes has continually evolved, always adding and creating more/different activities to enhance the level of fun and the learning of new skills,” said Way. Pacific Preschool & Kindergarten is dedicated to helping young children develop physical, socio-emotional, and intellectual skills for total wellbeing, a goal which aligns with Amazing Athletes’ purpose. “We firmly believe that the physical component is critical to a child’s overall school success!” said Way. 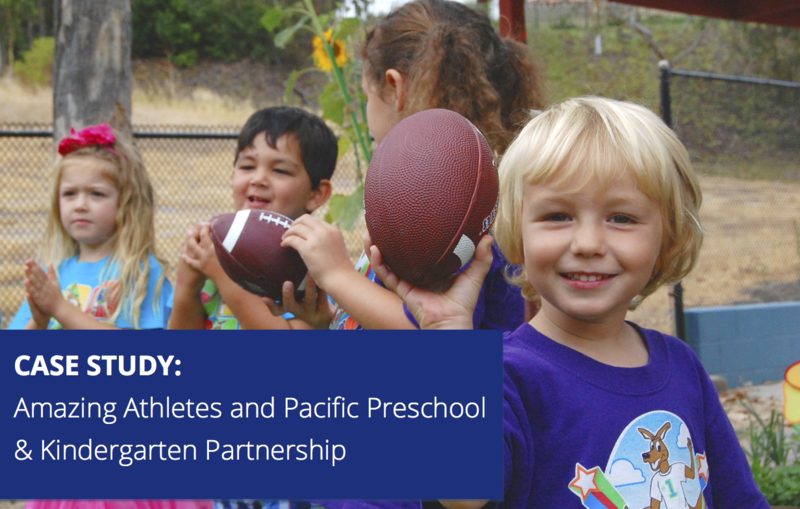 Pacific Preschool & Kindergarten has both health safety and nutrition supervisors at every school, but Amazing Athletes brings a fully-structured program and proven model of success for children’s health and wellness. Amazing Athletes provides a year-round, structured curriculum that introduces children to 9 different ball sports and helps them to master 7 key areas of motor-development. Children in the program learn to identify and locate 10 different muscles, distinguish the purpose of vitamins and minerals in their fruits and vegetables, and develop key fine and gross motor skills. The program is taught in a non-competitive, learning-based environment, where each child develops at his or her own progression level to ensure each is able to reach his or her highest potential. “This experience for our four-year-olds is truly an advantage adding to their learning process!” said Way. Read the full Pacific Preschool & Kindergarten Partnership Case Study! Learn more about Amazing Athletes’ curriculum and programs! Can you direct me to the research that ” …shows that students that engage in structured active play show better memory retention, focus, and classroom performance. Thank you!